A trumpeter swan new to Kitchener has already gotten itself in a pinch. The swan came to Victoria Park earlier this month around the same time as another pair of swans, Otis and his partner. That pair arrived on April 5, drawing attention after Otis had been single since his previous mate died in 2012. 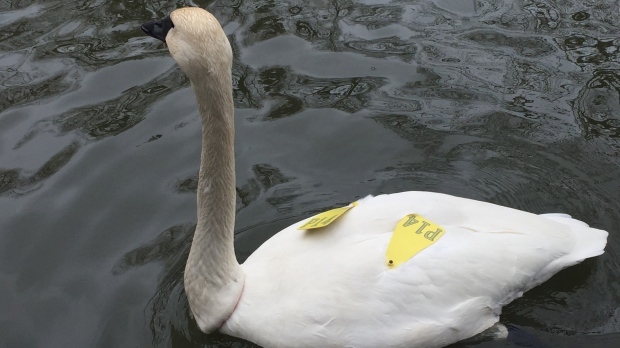 City officials aren't sure where the third swan came from, but are working to find his origins. Now, just six days after his arrival, the trumpeter swan has had a stroke of misfortune after getting something stuck around its neck. The City of Kitchener says staff is aware of the situation. The city says the swan is not currently in distress.